Chinese food is one of my absolute favorite items to splurge with and eat out. Of course, these days we do this less frequently thanks to budgets and trying to save money. Recently, I was asked by My Blog Spark to review a sample of the new Wanchai Ferry frozen entrée. I thought it sounded like a great concept and wanted to try it. Each frozen entrée has all the ingredients needed to prepare a great-tasting, complete Chinese meal for 2 in only 14 minutes! They come in five delicious flavors including Orange Chicken, Shrimp Lo Mein, Spicy Garlic Chicken, Sweet & Sour Chicken and Sweet & Spicy Shrimp. Additionally, all of the entrees have no added MSG! I was sent a package of the Orange Chicken variety along with a Wanchai Ferry "Stay-At-Hom" prize pack (one being offered to a lucky reader here on The Angel Forever – please see details below). Thursday, the boys and I went to spend the afternoon with my mother. I brought along my Orange Chicken package to make for the two of us for lunch. 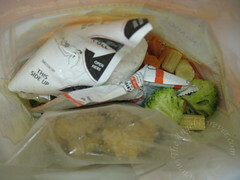 When I opened up the package there was a sauce packet, microwave rice steam bag, vegetables and package with chicken. 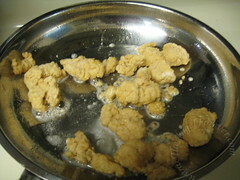 First, I heated some oil in a pan and tossed the chicken in to brown up. This only took 4-5 minutes. 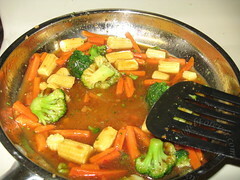 Once the chicken was out, the veggies, sauce and some water went in for a few additional minutes to warm up. 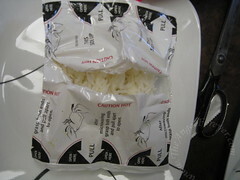 At the same time, my mother tossed the rice bag into the microwave. The rice was finished just in time to put the chicken back in with the vegetables and sauce. My mother and I were the ones that ate this meal. Both of us felt that it was a nice option to have at home for a quick and easy Chinese meal. The flavor of the sauce was very good. We thought that by making it another time the speed of preparation would have been better (I was not in my kitchen – so that hindered things some). Each of us felt that we would probably like something along with the meal, soup or salad if this was going to be our dinner. My suggestion was to add some additional frozen vegetables to the sauce to make it more filling and add still keep it on the healthy side. There was plenty of sauce and we felt it would work nicely. Since we keep kosher at our house, I could see making these when I visit my parents. You can purchase your own Wanchai Ferry meals in your grocer’s frozen food section and be sure to print out a $1.50 off coupon before you go. You can also find tips to enhance your Wanchai Ferry Frozen entrée on their website. MAIN RULE – Answer one of the following questions: What is the best fortune from a fortune cookie that you ever received? OR What is your favorite Chinese Food dish? 1 Bonus Entry per day – Tweet about the giveaway. Be sure to include @TheAngelForever and Wanchai Ferry frozen entrée in the Tweet. Please leave a direct link to your Tweet in a separate comment for each daily entry. To enter, please follow the rules above within the comment section. Contest starts today August 30th and ends at 10:59 EST on September 9, 2009. You do not have to be a blogger to enter, but must leave a valid e-mail address for me to contact you for mailing address once the giveaway is over. I will select the winner using random.org and contact you via e-mail. You will have 48 hours to claim the prize. If there is no response, another winner will be selected. Open to U.S. residents only. Disclosure: This review and giveaway was made possible by My Blog Spark. 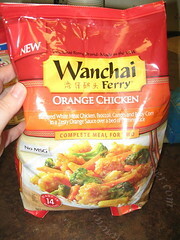 They provided me with the package of Wanchai Ferry frozen entrée and the prize pack. The opinions of this review were mine and I received no other compensation. .-= Jennai´s last blog .. =-. 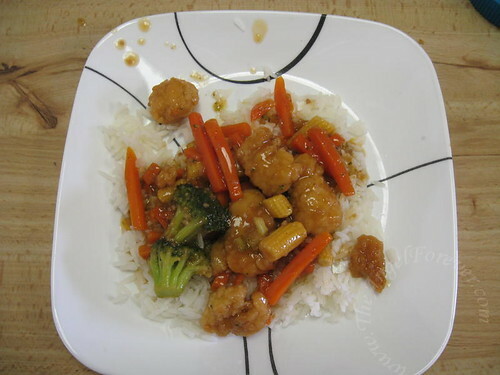 My favorite Chinese food is sesame chicken. 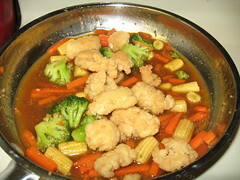 I like Sesame Chicken or Broccoli Beef. .-= Dani’´s last blog ..50% off Restaurant.com Gift Certificates! =-. .-= Rajee´s last blog ..Giveaways on September 09 =-. My favorite Chinese food is Kung Pao Chicken. Thanks for the giveaway! .-= icefairy´s last blog ..Let’s Play Giveaway #14: Frecklebox =-. I love Buddha’s Feast at P.F. Chang’s! My ultimate all time favorite Chinese Dish is Kung Pao Chicken. The hotter the better!!! !